“Poppy is our youngest daughter. She is a four year old little girl born on bonfire night 2013, and at Christmas 2015 she was diagnosed with Hyperornithinemia Hyperammonemia Homocitrullinuria or HHH. In the beginning Poppy developed well, putting weight on as expected. She smiled, rolled over, crawled and stood when expected and was a ‘well’ baby. Just before her first birthday things changed. She stopped putting weight on, suffered from a cough and cold which turned into a chest infect and had virus after virus. She had rashes and caught anything going. She also started being sick more frequently than ‘normal’. We would often go into her room at 4am to the sounds of her being sick. It was happening a lot – sometimes every night for a week, other times it would only be once in a month. There was no real pattern to the sickness. We wondered if it was when she had dairy products but couldn’t really pinpoint anything. We made numerous visits to the GP and health visitors but they didn’t want to know. By the summer of 2015 she was still not walking. She was 18 months old and people were reassuring saying she would ‘do it when she was ready’. It didn’t help. As parents we were concerned and finally managed to get someone to listen and a referral was made to the Community Paediatrician although it took until the beginning of December to actually see her! Saturday the 19th December 2015 was a normal chaotic Saturday, but also a day that would change our lives forever. When we sat down for dinner Poppy came over very tired. She didn’t look quite right; her eyes weren’t focusing and she was acting oddly; she was reaching out for things in front of her that weren’t there. I took her out of her high chair and took her into the living room where she seemed to wake up and come round. She started climbing on the sofa so all seemed well. Minutes later she then started doing the odd things with her hands again and her speech/words were slurred. Her breathing wasn’t quite right either, almost laboured. Poppy went via ambulance to the Royal Derby Hospital, she was drowsy and sleepy the whole way. 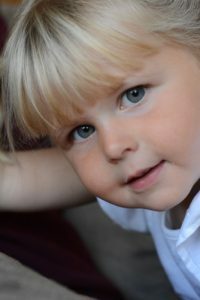 When we got to A & E we were told by the paramedic that we might never know what had happened to Poppy. CT scans, blood tests, full body scans and brain activity tests all took place over the course of the following couple of days but nothing was conclusive and Poppy was baffling the doctors. By teatime on Sunday, almost 24 hours since it started, we still didn’t really know what was wrong. They were questioning her blood clotting which was linked to the liver. She was given a Vitamin K injection to help with that. 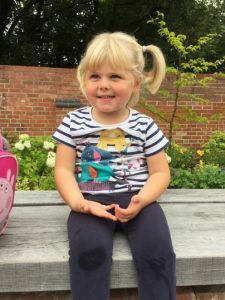 The doctors were honest and told us that they were consulting with specialists in Nottingham and Birmingham, and that they had sent some of Poppy’s blood and urine to Sheffield for specialist testing. By Sunday afternoon we were getting somewhere and some sort of explanation – Poppy’s liver was not breaking down protein properly. This would have implications on her diet so we were now talking to a dietitian too! She suggested that Poppy would need to go on a very restricted protein diet and, as we soon found out, protein is in everything! Monday morning bought the news that Poppy had a urea cycle disorder and that we would be moved to Birmingham Children’s Hospital to see their specialist team to learn more. Poppy’s condition day to day means we weigh and measure all of her food so that she does not take in more protein than she is allowed – at present that’s 18g. The weighing scales have become our best friend and go everywhere with us! She is also on regular medication Sodium Benzoate and L Citrilline. She has these four times a day and now takes them willingly no matter where we are! In herself, since diagnosis we have noticed massive changes in Poppy. She is walking now and although she still has regular physio appointments and insoles in her shoes she is getting more stable and will even run. Her speech has come on so much too. The biggest thing we notice is just how content Poppy is now. She wants to play and can and will focus on things much better. She is less frustrated and looks so much healthier in herself. We have always sat down as a family to eat, and all eat the same things. In order to not make Poppy different we try really hard to all sit and eat the same meals, although for Poppy this often means less meat or her ‘low protein’ or ‘protein free’ versions of foods. 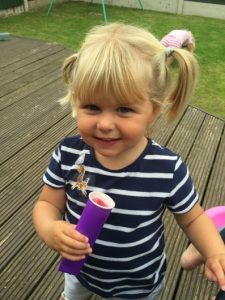 Given she was only just two years old at diagnosis Poppy, has really taken it into her stride and doesn’t miss any foods she’d had before. She loves cheese and pasta and she can still have these just vegan cheese and protein free pasta. Eating out has been more of a challenge but with prior planning we can do it and have found a whole host of places that will cook her pasta. We are all so proud of Poppy; she has come on in leaps and bounds since diagnosis and takes everything in her stride. She falls over, dusts herself down and gets straight back up again, she rarely cries and has such a cheeky personality and the most beautiful smile. She will face challenges; she will get ill and need her emergency regime and will no doubt have times when things are really tough for her but we will all be there to support her. If you are affected by Hyperornithinemia Hyperammonemia Homocitrullinuria, or any other Inherited Metabolic Disorder and would like more information on the condition, advice and support, or to be connected with other families, please contact us.